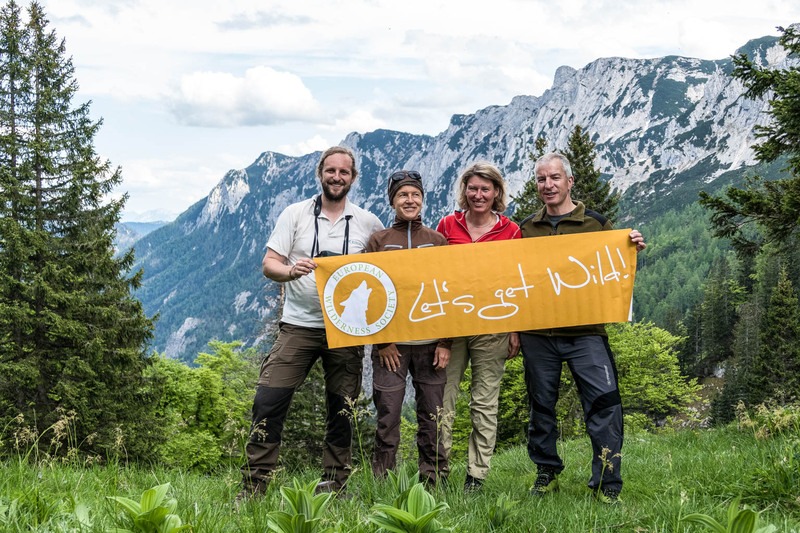 Windischgarsten, Molln: on June 2nd in the morning the Wilderness Audit Team of the European Wilderness Society, Vlado Vancura, Katrin Schikorr und Gudrun Pflüger started for their first field trip into the national park Kalkalpen. Their three day tour will bring them in the area of the Hoher Nock- mountain, which is the highest summit of the Sengsengebirge. At the parking lot of the Bodinggraben valley, they met with the national park Kalkalpen Ranger and employee of the Austrian federal forestry service, Dominik. Being a trained biologist and one of the 4 National Park hunters, he told and showed lots of topics, which were discussed in the office the day before in the field. The European Wilderness Society Team was enjoying his competent information, answers and discussions on the spot. The knowledgeable Ranger showed the team the winter show-feeding station for visitors of max. 25 people being able to observe up to 100 red deer coming to the place. The European Wilderness Society Team also learned about the history of human use in the nowadays national park area. Alms, (mountain pastures), logging, hunting and some grazing in the forests, some since hundreds of years, changed original wilderness into an area with several layers of human management. However, the topography of the land limited large scale impact and since the establishment of the national park in July 1997, its management under director Erich Mayrhofer is aiming to give wildness more space back. The national park with its more than 81% forest cover, 5% rocks and gravel and 6% dwarf pine (pinus mugo); steep rock faces, deep gorges and inaccessible slopes has a high potential for becoming a valuable place of wilderness in the heart of Austria. No mountain too high, now slope too steep no forest too dense on the way of learning about the wilderness area on the National Park Kalkalpen! That is a beautiful landscape and a great addition to the system.